Originally published: New York: HarperTeen, 2018. SHORTLISTED FOR THE WATERSTONES CHILDREN'S BOOK PRIZE 2019LONGLISTED FOR THE CILIP CARNEGIE MEDALTHE WINNER OF THE 2018 NATIONAL BOOK AWARDTHE WINNER OF THE MICHAEL L.PRINTZ AWARDTHE WINNER OF THE PURA BELPE AWARDTHE WINNER OF THE BOSTON GLOBE-HORNBOOK AWARD'I fell in love at slam poetry. This one will stay with you a long time.' - Angie Thomas, bestselling author of The Hate U Give'This was the type of book where "I'll just do 50 pages" turned into finishing it in 2 reads. I felt very emotional, not just because the story and the words themselves were so beautiful but because I knew it was going to make so many teens who felt like no one cares about them or listens to them feel seen.' - Tomi Adeyemi, bestselling author of The Children of Blood and Bone"Crackles with energy and snaps with authenticity and voice." -Justina Ireland, author of Dread Nation"An incredibly potent debut." -Jason Reynolds, author of the National Book Award Finalist Ghost"Acevedo has amplified the voices of girls en el barrio who are equal parts goddess, saint, warrior, and hero." -Ibi Zoboi, author of American StreetTHE POET X - a stunning New York Times bestseller with a powerful and unforgettable YA voice. Perfect for fans of Tomi Adeyemi's The Children of Blood and Bone, Angie Thomas's The Hate U Give and Sarah Crossan's One. Xiomara has always kept her words to herself. When it comes to standing her ground in her Harlem neighbourhood, she lets her fists and her fierceness do the talking. But X has secrets - her feelings for a boy in her bio class, and the notebook full of poems that she keeps under her bed. And a slam poetry club that will pull those secrets into the spotlight. Because in spite of a world that might not want to hear her, Xiomara refuses to stay silent. A novel about finding your voice and standing up for what you believe in, no matter how hard it is to say. Brave, bold and beautifully written - dealing with issues of race, feminism and faith - this is perfect for fans of Orangeboy, Nicola Yoon's Everything Everything and Zoella Book Club choice Moxie. 'A story that will slam the power of poetry and love back into your heart.' - Laurie Halse Anderson, author of Speak and Chains'Acevedo breathes words instead of air' - Lisa Heathfield, author of award-winning Paper Butterflies`Powerful, finely crafted verse . . . Readers will yearn to finish this verse novel in a single sitting, but its echoes will remain with them much longer' GuardianELIZABETH ACEVEDO was born and raised in New York City and her poetry is infused with Dominican bolero and her beloved city's tough grit. 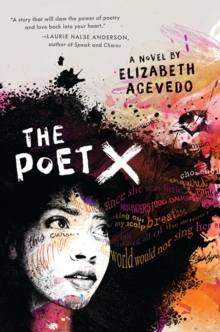 The Poet X is her debut novel and a National Book Award winner. With over twelve years of performance experience, Acevedo has been a featured performer on BET and Mun2, as well as delivered several TED Talks. She has performed internationally and her poetry has been featured in Cosmopolitan, The Huffington Post and Teen Vogue.